Thanks to the Montenegrin book I’ve been able to do all those twisty, bendy parts where diagonals meet horizontals or verticals. It was a lifesaver! I really like this interlace. 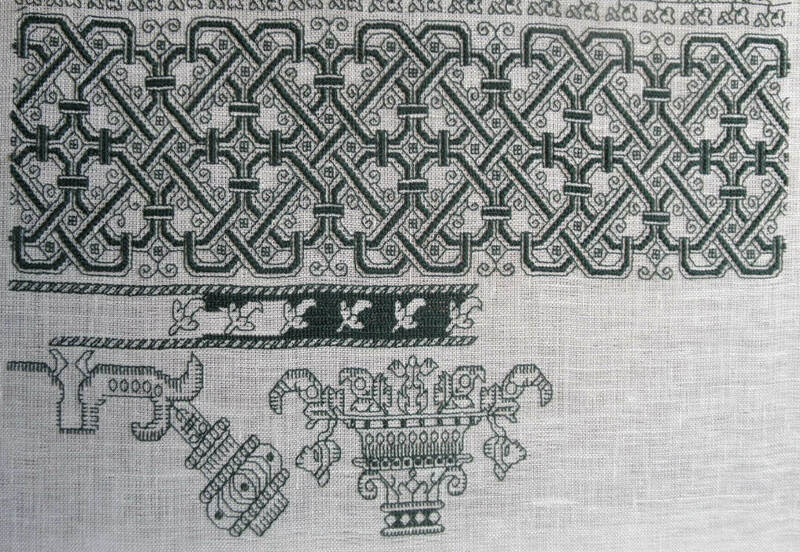 You’ll note by comparing my piece with the original below that my ground cloth is off square – not quite even weave. So it goes. I’m working that distortion into my pattern selection and placement. It’s very hard to see, but it looks like there might have been spangles in the empty spaces between the internal curlicues. There may be a spangle in the upper left (better seen at the full photo at the link), where the work is the least damaged, plus some evidence of now empty holding stitches, and some corrosion aligning with where the spangles would have been. This pattern would make a killer coif or all-over sleeve panel with spangles there, and maybe a few more replacing the little four box free floating squares. I’m thinking of working it in black and gold with spangles for a modern envelope clutch style evening bag. In any case, that strip is now done and I’m on to the next – a rather complex urn and branch with a very dark and solid background. It’s going to take a lot of stitching to cover all that real estate in long armed cross stitch, so progress on the piece, once the double running foreground is all laid in will be very dull to watch for a while. Good thing I have other content lined up. I am however less than pleased with the Zoundry Raven blogging composition software I’ve been using. The last few posts have killed it. I can get them composed and loaded if I do all the work in one session, but I can’t call up a previously started piece for additional work – not even to copy out text and recompose in a new post. That means that I’ll have to re-draft the next several Long Lost Twins pieces. Stay tuned!